With a name that seems more fitting for a battle ship I was interested in trying figure out the reason for the name. However I was unable to find this information and so we'll have to use our imagination. At first glance this is a pretty simple looking jogging/training shoe. It's got suede in the ankle and heel areas and also in part of the toe cap. Then it appears to have mesh throughout the rest of the shoe. Then as you'll see below the shoe really seems to come alive with the outsole, which I must admit seems rare. To me the best part about the outsole is that it obviously has a purpose for being designed in such a way. The heel and forefoot areas make the most sense to me. The pods, for lack of a better term, are gathered around particular strike areas. The heel has the largest grouping with a heel stabilizing bar for good measure. Then the pods get wider almost like ovals in the forefoot were the ball of your foot would strike and the push off. However, I am not quite sure of the reason to place certain pods in the midfoot where the arch of your foot is. My best guess is so that the shoe did not completely sink in the midfoot while still providing cushion and return in more populous pod areas. If anyone has any ideas on this please post. 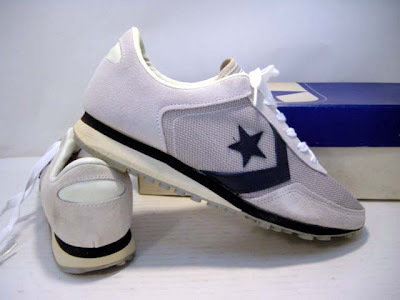 A few years ago Converse re-issued a shoe called the Arizona Racer, however upon further review I don't think it was based on this shoe. Which means there could have been at least one other shoe with the Arizona tag. This re-issued shoe also featured the pods, but they were place all over outsole. 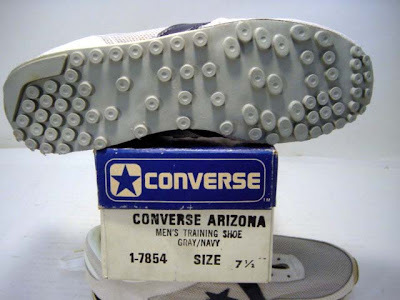 So I am guessing that the Arizona line of running, jogging, or training shoes all had these pods on the outsoles. Well that's all for today, I wish I had some more pictures, maybe I can find some more. Enjoy your Labor Day weekend. Watch a lot of college football and eat lots of grilled meats. Thanks for reading Converse NCAA's Friday Flashback.